Today Nestlé Purina announced the launch of the Pets at Work Alliance across Europe to unite and support organisations in bringing pets to the workplace. "At Purina, we believe pets and people are better together – said the company –, especially at work, and we know from experience that having pets at work has a significant positive impact on employee’s mental and physical health". 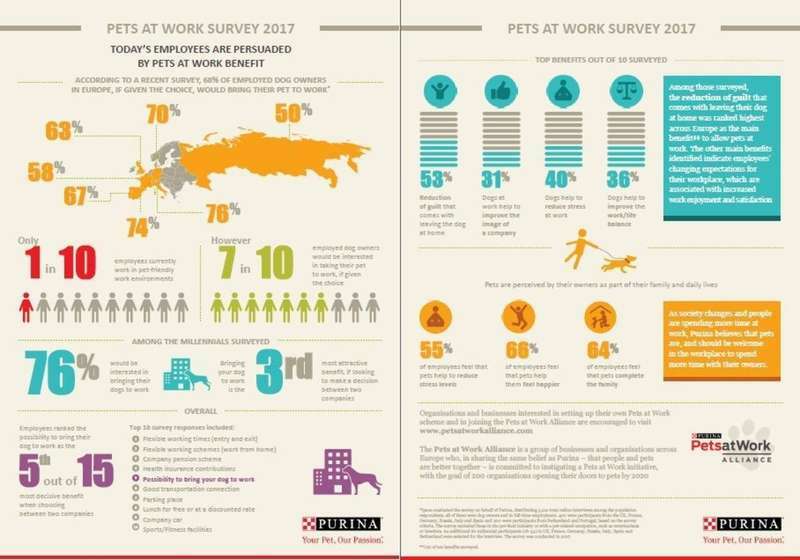 Purina is working with, and providing support to businesses across Europe to join their Pets at Work Alliance, with the aim of having 200 partners on board by 2020 as per its Purina in Society commitments. Nestlé Purina PetCare, the global leader in pet products, is part of the Swiss company Nestlé S.A., a world leader in nutrition, health and wellness. For over 120 years, Purina has been one of the pioneers in delivering nutritious and tasty products that meet the highest standards of quality and safety. The Pets at Work Alliance is made up of a group of companies and organizations all over Europe who, sharing the same conviction of Purina - namely that people and pets are better together - is committed to promoting the policy at Pets at Work aims to ensure that 200 organizations open their doors to pet by 2020.